The year 2013 may prove to be especially challenging for Scorpio people as they feel cramped for space and this leads to frustrations. However, Jupiter will turn into your favour around the middle of the year which will give you a lot of relief in all areas of your life. Higher education is on the cards. Work wise too it will be a challenging year and you shouldn't lower your guard. Those with a creative inclination will be blessed with fame and money both. This is a rare phase, and Scorpio people should make the most out of it. Travel is also on the cards. Scorpio people should not be dominating, especially during the first part of the year. You may take out the frustration in other areas of your life on your family life, which is not good and you should be mild and compassionate with your loved ones. Maintaining peace and harmony at your home will be solely your responsibility this year. Hence, you have to control your short temper and handle situations with a great deal of maturity. This year is going to be especially good for singles. Scorpio singles are likely to meet up with interesting people if they keep their mind and attitude open. If you are already into a relationship, then don't be over-possessive or jealous, which may harm your relationship. This year may prove to be very stressful for married couples. If you wish to save your marriage, then you shall have to be extremely patient, compromising and strike a balance at any cost. This is not the right time demonstrating rigidity in relationship matters. 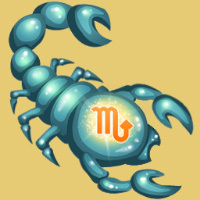 If Scorpio people care to avoid stressful situations, they are unlikely to face any health-related issues this year. Except for small hassles, you shall remain physically fit. You should however avoid mental disturbances as it might lead to skin problems, stomach upsets and you may even begin to lose weight. It is advised for you to maintain a balanced diet and a regular lifestyle and keep away from intoxicants such as smoking, drinking or chewing tobacco. Whatever health regime you start now, you can sustain it for few more years at least. Scorpio people might face problems with their co workers this year. However, your bosses will be on your side because you are a diligent and a hard worker. You will slog hard this year, but the dividends will not be visible this year. After May, it is quite an auspicious time to change your job. On the business front, things will be streamlined and you will get many business offers. First half of the year is not conducive for the expansion of business. However, you may implement your expansion plans in the second half of the year. During unfavorable circumstances, it is best to hang on and be patient till things turn for the good. Don't take out your frustrations of other areas of your life on your family members and loved ones for it will be counterproductive.